Thanks. It's interesting that Elladj Baldé is listed as an alternate even though he announced his retirement. I guess he hasn't done anything to lose his eligibility at this point. He was listed as an official alternate at the end of Canadians and apparently Skate Canada submitted his name to the ISU, presumably with his consent. Elladj is actually skating in the "Art on Ice" show in Switzerland at the moment so he wouldn't have far to go if he got called in, in an emergency. Last edited by Elizabeth on Thu Mar 01, 2018 3:00 pm, edited 1 time in total. And Stolbova/Klimov listed as second alternate?? Isn't she in a cast somewhere?? Yes, but I gather that was quite recent, perhaps just before the deadline for submissions. The whole Russian team, especially in pairs and dance is in a bit of disarray, I think. They are just trying to "cover their bases", I believe. U.S. Figure Skating announced today roster changes for the upcoming 2018 ISU World Figure Skating Championships, set to be held in Milan from March 19-25, 2018. Olympic Team Event bronze medalist Adam Rippon and two-time Olympic bronze medalists Maia and Alex Shibutani have withdrawn from the event. Third alternate Max Aaron will replace Rippon in the men’s event. Both Jason Brown and Ross Miner, the first and second alternates, respectively, declined invitations to the event. Aaron won the bronze medal at Cup of China in the fall, and recently placed fifth at the Four Continents Championships. This will mark Aaron’s fourth appearance at the World Championships. First alternates Kaitlin Hawayek and Jean-Luc Baker will replace the Shibutanis in the ice dance event. The duo won the Four Continents Championships in February and placed fourth at the 2018 Prudential U.S. Figure Skating Championships. In total, sixteen athletes will represent the United States in Milan later this month. Oh, I was hoping to see Jason Brown again, he is one of my favourite skaters. Is he planning to retire? There are rumours of a coaching change for Jason but nothing has been confirmed/announced at this point. As anticipated, it has been announced that Yuzuru Hanyu has withdrawn from this month’s Worlds in Milan due to injury. He will be replaced by Kazuki Tomono. Yuzuru will be continuing to rest & rehabilitate his ankle. I cannot understand why Ross Miner or Jason would not accept the invitation to Worlds, or why the Shibs would withdraw. With so many no longer participating, this could be a real opportunity to boost a world ranking, and/or help guarantee more spots for future worlds. I'm disappointed. Well.....not disappointed not to have to sit through another Shib's routine, to be honest I'm hoping that Soucis/Firus arrive and shake things up a LOT! The Shibutanis have been very busy with many non-skating activities since their return to the USA, as has Adam Rippon. Sui and Han have withdrawn from the Worlds due to stress fracture on her 2nd metatarsal bone of right foot. She was already injured at the Olympics but didn't know it was fracture. She will need to rest for at least 6 to 8 weeks according to doctor's advice. Oh no!!!! Will these two ever be able to cut a break? I hope she can heal. With all the surgeries to her feet, this is certainly not good news. 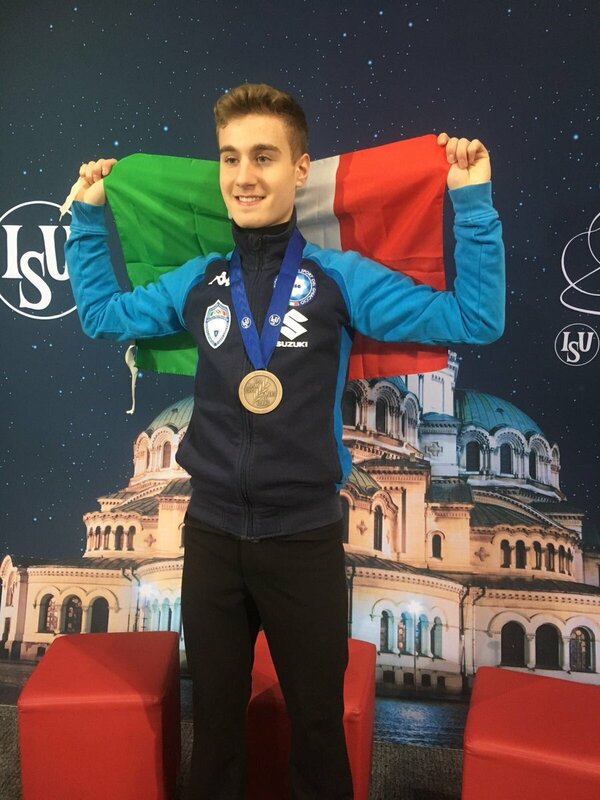 The World Championships will make the 12th competition this season for Matteo Rizzo ITA who just won a bronze medal at Junior Worlds! I think he has to be the hardest working skater out there this year!! Hope Matteo enjoys the short break while the rest of us adjust to this morning's time change. In case you are wondering who the tiger is, that is the current Olympic ladies champion as she appeared in the Exhibition Gala in PyeongChang. I still haven't reset my clocks. I saw the time change and then forget about it. It's caused no problems because I spent all day yesterday not looking at the clocks, so it made no difference. I suppose I'll have to do that sometime soon. Keeping this on the topic of the World Championships, be sure to check the CBC website and your local listings regarding times for Worlds. I understand that DST only comes into effect in Italy during the championships! MOSCOW -- Olympic figure skating silver medalist Evgenia Medvedeva has withdrawn from the world championships later this month, ending the prospect of another showdown for gold with her friend and rival Alina Zagitova. The Russian Figure Skating Federation says Medvedeva has a recurrence of the foot injury which kept her out of the Grand Prix Finals last December. During the Olympics, Medvedeva said the injury didn't bother her as she lost to Zagitova by 1.31 points for the gold medal. However, the Russian federation now says Medvedeva "had to fight painful sensations while skating at the Olympics" and doctors have ordered her to strictly limit any jumps from her injured foot for at least four weeks "in order to avoid possible surgical intervention." That makes Zagitova the clear favorite for gold at the March 21-25 championships in Milan. I'm looking forward to it - it will a chance for "redemption" for some; an opportunity to rise to the top (or at least the podium) for others; and the first view in the new quadrennial we might have of some "up and comers". Great! Are you meaning you are recently retired? No, Kitty, I have been retired for over 20 years, but I was in Mexico during the Olympics and they didn't stream or video anything across the border. Jackie Wong reports that Denis Ten is out of Worlds and Abzal Rakimgaliev is in for KAZ.